In the last post, I presented P_TRIMP, a power-based version of TRIMP for durations larger than 1 hour. The fact that it is directly based on TRIMP makes it a considerable improvement over other approaches, since it is directly based on the scientific evidence on this subject. It is ironic that some people that have never done any studies on this subject, besides being the Internet champions of the “evidence-based” methods, choose to ignore the scientific evidence in favor of their own beliefs. It seems that science only exists when it serves their interests, and that their ego-driven pseudo-science is more important than the peer-reviewed real science. If you add to this the public ad-hominem attacks, it all amounts to a classical case of intellectual dishonesty. But all these metrics, the impulse-response models, training load quantification, what is it good for? ABSOLUTELY NOTHING! Very often, the ones that see using the impulse-response model based training load quantification as the absolute right way of coaching, operate under the assumption that those that do not use these methods, do so because they have a difficulty in understanding them. With this series of posts, I tried to show that there are a number of coaches (because I am not only not alone, but belong to a large “silent” majority) that understand the subject to the point to know how useless it is for training and racing. Using training load quantification tools has very little to do with coaching. It might be a curiosity for some that are not interested in performance, or maybe a way to distinguish themselves from a marketing point-of-view, but it is certainly not the way the top endurance coaches operate. All this emphasis in meaningless “metrics” forgets the most important part of the equation: the athlete. Athletes are not simple systems that can be modeled by a few variables. This is something that good coaches have identified throughout the years as the main aspect of coaching. And while those coaches work to prepare their athletes for the biggest stages in endurance sports, the pseudo-scientists post away on Internet fora. Like I mentioned in this post, although TSS is inspired on Dr. Eric Bannister's heart rate-based training impulse (TRIMP), it has the downside that, unlike TRIMP, it has not been validated in any scientific studies. The biggest downside of TRIMP is that it is heart rate based, which means that in the context of quantifying training load in the impulse-response model of training adaptation, the input is itself a response and not a direct measure of the stimulus. Now if we equate the fraction of heart rate reserve, an indirect measure of intensity, with IF, a direct measure of intensity, we will have as input on TRIMP a direct measure of the stimulus in the impulse-response model. Given that under controlled conditions heart rate will vary linearly with power, we can assume that IF=1 will correspond to a percentage of heart rate reserve. In the following discussion, it was assumed that IF=1 corresponds to 90% of heart rate reserve. This was a number thrown around frequently back in the days when the “Karvonen formula” was used for the heart rate corresponding to what we call now Functional Threshold (IF=1). Also some of the assumptions made are only valid for durations over one hour. P_TRIMP has the advantage that is directly based on TRIMP, which means it is strongly correlated to the considerable amount of scientific evidence that supports TRIMP. Furthermore, it uses a direct measure of intensity as the input on the impulse-response model of training adaptation. Figure 1 shows the curves for P_TRIMP =1, 2 and 3 respectively. For comparison, curves for TSS/100=1, 2 and 3 are plotted, as well as a universal Power vs Duration curve. As we can see, the P_TRIMP-constant curves differ considerably from the TSS-constant curves, with the difference being greater for longer durations. 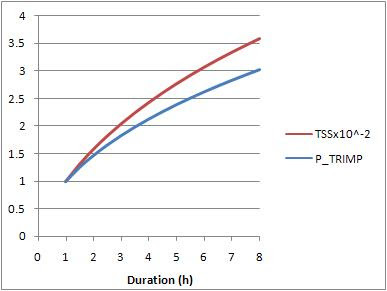 Figure 2 shows a comparison between P_TRIMP and TSS, using as input the above mentioned approximation for the Power vs Duration curve. Therefore, what is shown are the curves for the maximum TRUMP and TSS possible for a given duration. It is clear from the comparison that TSS overestimates the training load for increasing durations. This somewhat agrees with the sentiment by those that use TSS to quantify training load that it puts an excessive weight in duration vs intensity. Conclusion: A new training load estimator directly based on TRIMP was presented. Further validation through scientific studies is needed in order to warrant its use. However, the fact that it is directly based on TRIMP means it is already a considerable improvement over TSS. 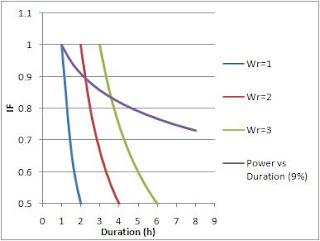 Figure 1 shows curves of constant Wr as a function of IF and Duration, along with a typical Power vs Duration curve. 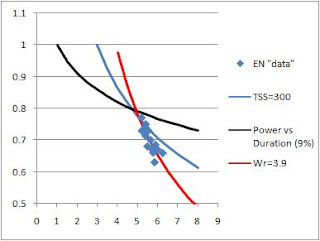 Figure 2 shows the EN “data”, along the above mentioned typical Power vs Duration curve and the now shown useless TSS=300 curve. The thing that is curious about the “data”, and that a very small number of the readers of this blog might find interesting, is that it falls along a curve of constant Wr. So it would appear those athletes were all spending the same energy (scaled with individual FTP) during an Ironman bike leg. Unfortunately, the reduced number of data points along with the subjectivity in picking the data set, renders this “conclusion” virtually useless. It is very likely that this constant-work hypothesis is just the result of this particular set of data points. In the last post, through the use of two very simple examples, it was explained why TSS should not be used as an effort budget and it was shown the reason why TSS-constant curves appear to yield IF’s that translate into correctly paced Ironman bike legs. The post generated quite a bit of discussion, and I feel that some of it was useful. Among the useful bits was the evidence on the exact shape of the Power vs Duration curve. 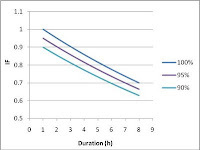 Figure 1 shows the Power vs Duration curves for constant percentage drop-off for double the duration, i.e., log(t) curves for 11, 9 and 7% drop-offs, respectively. To those curves, within which the vast majority of the individual Power vs Duration curves falls, the TSS=300 curve was added. As we can see yet again in this example, the TSS-constant curves “cut” across the possible intensity levels, with an obvious "disregard" for the Power vs Duration curve. 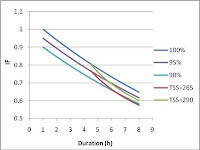 Even for the durations that served as basis for the development of the “method”, the 5-6h range, the “TSS method” gives IF ranges for the cap or the starting point or whatever anyone wants to call it that are simply too big for such a small variation in duration (0.71 < IF < 0.77). So how did TSS get involved in pacing strategies? Likely, just because it was there (Another "metric" that happens to be there is VI - another metric that is nothing more than a curiosity). Those that think that looking at numbers is the same as producing relevant data noticed that TSS fell into a nice range for triathletes that were subjectively considered to have “ran well”. While doing that, they forgot that TSS is used to quantify training load in the rather simplified impulse-response model of training adaptation, used to model training-induced changes in performance. This obviously has nothing to do with pacing strategies for a triathlon. It should be self-evident to all that when we are talking about pacing strategies for triathlon, the only overall metric that makes sense to use is IF. On top of being an overall measure of exercise intensity, only IF is directly related to the Power vs Duration curve. The use of IF is also very intuitive. In order to be able to run well off the bike, a triathlete reduces the intensity, IF, of her effort on the bike from the level of effort she could do in a maximal effort, given by the Power vs Duration curve. Only the Power vs Duration curve is “real”, in the sense that it relates to a maximal effort for a given duration. A triathlete uses a fraction of that effort in order to be able to access her running fitness, with the ultimate goal of minimizing the overall race time. TSS has the advantage that it is easy to calculate and that it is based on the direct measurement of the applied stimulus (power), unlike TRIMPS that is based on heart rate. However, unlike TRIMPS, TSS has not been validated in any scientific studies, which means that its use by many comes from believing that it is a good tool to estimate training load. By definition, TSS’ units are time and therefore TSS is a equivalent training time at FTP. If we leave out the constant 100, we will see that in reality TSS is nothing more than equivalent training time in hours at FTP. So a 200 TSS ride is a training load equivalent to 2 hours at FTP (if that was possible in one ride). So from the definition of TSS we can see that it was created and should only be used as an estimator of training load, and using it as some sort of “effort budget”, besides going beyond the scope of the definition, is fundamentally wrong. For a given duration/power level, the individual (Power vs Duration) curve gives us the maximum power level possible for a given duration. For durations above one hour, and if we non-dimensionalize power with individual FTP, it is likely that the individual curves (IF vs Duration) for well-trained endurance athletes fall in a very narrow band. For the purpose of this discussion, let’s say that there is an exponential relation between duration and IF. In order to “anchor” this curve, the upper end is obviously FTP (1,1). The other point that defines the curve can be a common intensity estimator for maximum efforts lasting 2 hours – IF=0.95 (2,0.95). 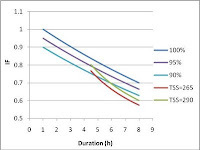 Figure 1 shows the non-dimensionalized (Power vs Duration) curve, as well as curves for 95% and 90% intensity, respectively. Now if we turn our attention to the problem of pacing the bike leg of a triathlon, the issue of running off the bike is going to be dependent on the intensity of the bike effort. It is not a big conceptual stretch to think that there is a threshold of effort above which an athlete won’t be able to run up to his full potential (the answer to what constitutes “running to its potential” is a whole different world). If we express this concept using the (Power vs Duration) curve, for a given duration, there will be an intensity above all running off the bike at a pace according to your running specific level of fitness will be impossible. That intensity threshold should be somewhere between 90 and 95% of the maximum effort for a given duration. This means that a correctly paced Ironman bike that lasts 4:30h will have an IF between 0.75 and 0.79 and that a correctly paced lasting 6:00h will have an IF between 0.74 and 0.70. Some approaches to the determination of correctly paced ironman bike rides use TSS as an effort budget. Like it was mentioned above, this does not make much sense, since using TSS as an effort budget goes beyond the scope of the definition, not to mention not being supported by any kind of evidence. In order to illustrate this, let’s take an example using the above (Power vs Duration) curves. According to some sources, a common range of TSS scores that represent a correctly paced IM ride is between 265 and 290. Figure 2 shows the TSS-constant curves for 265 and 290. So for this range, we can see that for a 4:30h ride we have an IF between 0.77 and 0.80 and for a 6:00h ride an IF between 0.66 and 0.69. 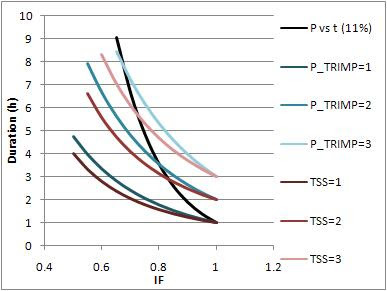 As we can see from Figure 2, even if using this approach the values for IF are not far off from those from the approach I delineated above, it is clear that the shape of the constant-TSS curves doesn’t make sense from a pacing point-of-view. It is clear from the figure that this approach prescribes decreasing IF’s for increasing durations, which makes for extremely conservative estimates for the slower riders. On the other end of the spectrum, for the fastest riders it prescribes high IF’s that are clearly above what is generally accepted as a correctly paced IM bike ride. Above all, the increase in IF with decreasing duration doesn’t make sense from since in the limit we would have IF’s above the maximum (Power vs Duration) curve. 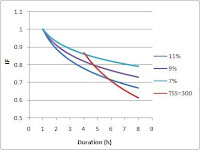 Of course the relative proximity of the TSS-constant curves to the Power/Duration curves is dependent on the “slope” of the (Power vs Duration) curve. If for example, we anchor our maximum curve to a different point, the TSS-constant curves will be closer/further from the (Power vs Duration) curves. Figure 3 shows the comparison for the points (1,1) and (2,0.94), meaning an athlete that for a maximum effort lasting two hours has an IF of 0.94. For this example we can see that a TSS between 265 and 290 will be in the right range of IF’s for longer durations, but that the IF’s for the shorter durations are grossly overestimated. In conclusion, through a simple set of examples it was shown how using TSS to choose the intensity to race an IM bike has the potential to either grossly underestimate or overestimate the effort needed. The fact that the 265 to 290 range has come up is likely because it is based on a set of data for durations between 5 and 6 hours. The said range is the product of the correctly paced rides, and does not represent any sort of effort budget. I would suggest that if we’re looking for a realiable effort budget, the actual work being performed for a given duration needs to come into play. But this is hardly a new concept.